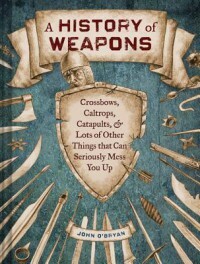 A compendium of weapons from pre-history to fairly-recent history, illustrated throughout. This book is NOT for children - more four-letter words than an episode of Hell's Kitchen. But it is for adults with a sense of humor who want to know about a broad variety of handheld weapons, not just from European history, but from the Egyptian, Chinese, African, Mesoamerican, Indian, and Native American theaters, as well. As funny as it is informative, I especially recommend it for RPG geeks who don't take themselves too seriously. Douchebag nerds need not apply.